The autumn/winter season is a tricky one. I love this time of year. My skin, however, does not. It’s tempting to go mad for the heaviest moisturisers I can find but to be honest, most of them end up being far too greasy for my liking. 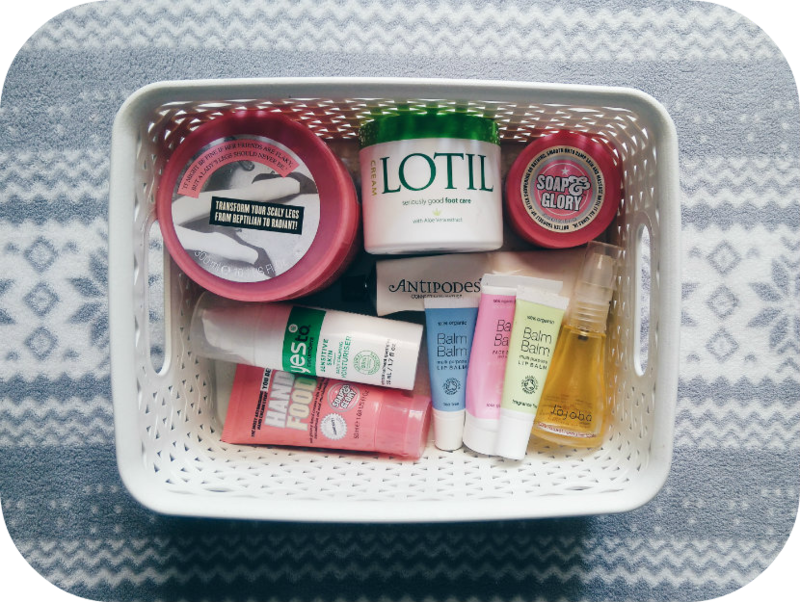 Thankfully I’m well on my way to building a collection of products for face and body that I can rely on — mixture of new discoveries I was very lucky to be sent (PR samples are marked with a *) and old favourites I always repurchase. Let’s get stuck in. The body scrub I always come back to, no matter what. Flake Away is grainy without being too harsh on the skin and it really makes a difference to dry areas like elbows and knees in particular. The fruity, musky scent is lush too. A cream for the feet which is actually more like a thick balm and smells a teeny bit like almonds. The skin on my feet is ridiculously dry but this stuff is incredible, and works a treat at softening the many (many, many…) rough patches my feet seem to have. I like to apply a tonne of the Lotil Foot Cream and then put a pair of socks over the top before I go to bed. There’s something oh-so-satisfying about embracing a full-on Soap & Glory scent. This is actually one of the few body butters I can bear to use because it sinks in reasonably quickly, doesn’t feel sticky, and keeps your body moisturised for hours and hours. The scent is the same as the Flake Away one, too, so you can layer up. This natural oil can be used on your face, on your body, on your skin, and even on your hair. I do love a multi-purpose product! Personally, my favourite use for it is all over the body after a shower, or on my cuticles as a treatment before bed. I find the consistency quite thick for an oil but it sinks in reasonably quickly and I think there’s something quite luxurious about applying oil to the skin. Jojoba has plenty of benefits (it’s antibacterial, anti-fungal, and anti-inflammatory) and since it’s an oil, a little bit goes a long way, especially with the pump dispenser. I’ll definitely be investing in a bottle when this one runs out. These moisturising balms are a welcome addition to my collection of lip-care products. They becoming strangely runny after a while so I don’t like taking them out in my bag, but I’m happy to keep them at home for overnight use. The Tea Tree version is a particularly favourite — I just really like the scent and tea tree has antibacterial properties too. I’ll admit, I was a little wary at the thought of trying out a balm on my face — would it be too thick and clog my pores? Luckily it melts beautifully upon contact with the skin and hasn’t upset my acne at all. This Face Balm sits really well underneath make-up and hydrates any dry patches (which unfortunately start to appear at this time of year). A soothing spot-buster that softens the skin. I adore this mask because it does pretty much everything you could wish for: it calms down spots, hydrates the skin, and gives it a lovely, healthy glow. Pricey but so worth it. My morning essential. Yes To are one of my favourite high street brands for reasonably priced cruelty-free products and I was lucky to grab this while it was reduced to £7.99 (Boots have Yes To on offer quite a lot so it’s worth keeping an eye out!) This moisturiser is so soothing and yet so light at the same time, and it doesn’t upset my acne, even when I’m having a flare up. I own so many hand creams but Hand Food is by far the one I reach for most! I’m so bad at remembering to use hand cream so I try and keep it in places where I might see it and pick it up. This one lives by my bed and makes me smile every time I sniff the girly vanilla/musk scent. What products do you like to use when it’s cold? Have you tried any of these? Let me know in the comments!